If clubs sign up as a Glamorgan Club Ambassador in 2018, you will receive a Club Night Out Poster for your clubhouse and a free T20 Season Ticket. Clubs as encouraged to start promoting this fantastic offer within your club and across your social media channels using the image in the header. Bring a large group from your club to the Friday night fixtures to make the most of this offer. You require a minimum of 20 paid adult tickets and kids go FREE! (NB the club should ensure proper supervision for those U17s). 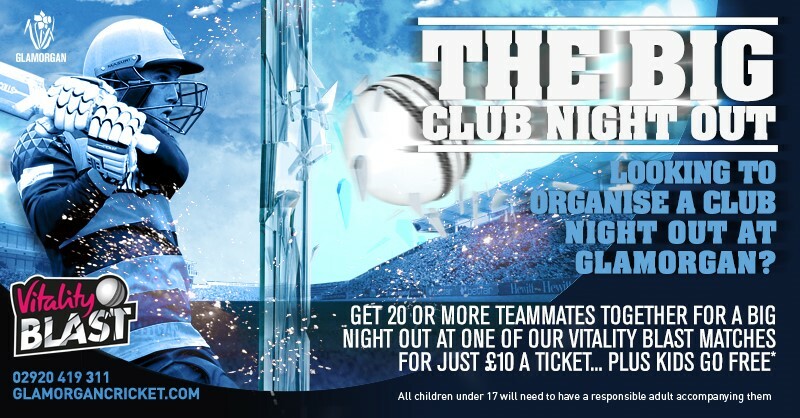 Please send your BIG CLUB NIGHT OUT ticket requests to tickets@glamorgancricket.co.uk. Launched in 2013 the Glamorgan Ambassador programme enables clubs and organised groups to earn benefits by supporting Glamorgan CCC. The programme is open to all sports clubs and their members ranging from your nearest village cricket team to a professional sports organisations, so is not limited to cricket clubs, however 95% of registered clubs are Welsh cricket teams currently. Glamorgan CCC is delighted to confirm Ambassador Clubs can save £10 on T20 Season Tickets which gives access to all 7 home fixtures. When used in conjunction with your free T20 Blast season ticket a second one can help you fundraise for your club, for instance as a raffle prize. We would like each club in the Ambassador programme to choose at least one game from the fixture list and organise a club trip to watch that match. This will ensure a great social and bonding activity for your club, enable us to ensure you have a memorable day by providing you with a great level of service and of course for you to reap the rewards of the scheme and win prizes! Clubs can also save £10 on one additionally purchased T20 Season Ticket (7 group matches). When used in conjunction with your free T20 Blast season ticket a second one can help you fundraise for your club, for instance as a raffle prize. This was launched in 2017. If 30x T20 Blast adult tickets are purchased over the season using your club code, your junior section will be invited to enjoy a free stadium tour later in the year. Other Offers relevant to Clubs that have signed up to ALL STARS CRICKET…..
We will also support clubs with all stars in 2018 with 3x International Tickets. This will be issued directly to clubs via Cricket Wales and so clubs do not need to apply. We would like to see as many children and families as possible at our range of matches in 2018.